Unless you spend a lot of time watching Iowa high school track, or have kept up with the Junior Olympic scene in the summer, you may not know a lot about Wellman (Mid-Prairie HS) IA senior Aaron Stockstell on the national scene, despite the fact that he nearly broke 1:50 for 800 meters as a junior. That could well change in the next few weeks as he and his teammates run their first Nike Outdoor meet. Stockstell has been dominant in 2A Iowa competition, especially since his coach convinced him to try the 400 and 800 over the 100 and 200. After his soph season, he was 4th at USATF JOs in the YM 800 at 1:52.85 and was part of a 7:39 4x8 relay. He won his 2nd straight state titles in the 4 and 8 as a junior, then hit 1:50.18 (losing by .01) in a classic 800 duel with Andrew Perkins at the Midwest Distance Gala last June. Then he won the YM 800 at USATF JOs, with 1:53.09. So, coming into this season, Aaron was the nation's #3 returnee at 800. At this year’s Iowa state meet, he and his teammates hit new heights, running a US#1 3:26.16 1600 medley, and with Aaron tripling individually in the 200/400/800 (21.96/47.67/1:51.17). It all added up to a first-ever state title for Mid-Prairie. But now in two weeks, Stockstell and his teammates will be making their first appearance in Greensboro. A few days after the state meet, DyeStat News Editor SteveU caught up with the University of Alabama signee. 1. Take me through the state meet with you and your team, event-by-event, day-by-day. What was the journey like from the US#1 SMR, to the 400, 800 and finally that 200 at the end? 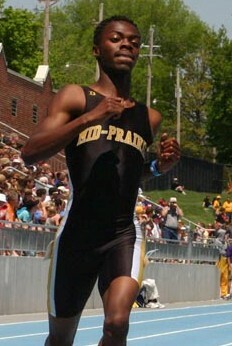 The state meet started with me running the 200m prelims on Thursday at 1 p.m. I was seeded 2nd going in to the meet. I finished second in my heat, and was seeded second going into finals. I then had to quickly get off my feet because I had the open 400m just minutes away. At about 1:35, it was time for the 400m. I was also seeded second going into this race. So I was out in lane 5. I ran a pretty solid race, 47.64. Day one of my Senior state meet was over and off to a pretty good start. Day two was a little different. I had to run only one race on Friday. the 1600m medley. Going into the race, my teammates and I wanted to set a new 2A record. So it was a HUGE shock to all of us when we ran 3:26.16. Our guys ran a great race. Lance ran a 48.5 split on the 400 leg, and then I topped it off with a 1:49.8 split. The thing about this race was that we were in the "slow" heat (due to running slower at region meet just to qualify). Coach told us to keep doing the little things! That has been a team slogan for the past few weeks. Friday continued to be big day for the team as we had many relays start to tally up points to put us in the team title hunt. Saturday was the third and final day. My first race was the open 800m run. I wanted to get out and seal the deal (team title). I ran my season best, 1:51.17. The race was really hard to run. I was all out there by myself. 2nd place was 7 seconds back. After the 800 the team and I were almost there. All we had to do was finish as well as we started. I had about 2 hours to get my feet up and rest a little bit. My last race was the open 200m run. I am NOT by any means a 200m runner. The only reason I ran the 200m was to grab points for the team. Even though we pretty much had the team title, I wanted to end with a bang. I won in 21.96. The best three days of my life was what we ran at the state meet. It was unreal; you can only dream of stuff like that. The journey was a milestone in not only my life, but for my teammates and coach also. 2. You’ve had a lot of individual success, but what was it like winning the first state title for your team as a senior? I’ve heard you are part of a great senior class there. Tell me about these teammates of yours and what some of the keys were to rising up to win the title. Winning the team title as a senior was GREAT, because it shows the progress our TEAM has made as a TEAM! I think a lot of it has to do with everybody knowing their role. We had some guys that really stepped up. We all knew what had to be done. Everyone was on the same page at the same time. Coach Hollan was the key factor for us winning the state title in my mind. He put the pieces to the puzzle together. Not only did we win with what he put together, but we scored the most team points in class 2A state meet history (69 points). I tip my hat to all my teammates as they all help bring home the hardware to Wellman. 3. From what I heard, some of the aspects of your approach to the sport have changed this year. The Aaron Stockstell in the past might not have run a 200 at state if he wasn’t sure he could win it, but now you do it without question. What’s changed? You are 100 percent correct, the Aaron Stockstell in the past would NOT have ran the open 200. I was scared of losing respect as runner if I lost a race. I think getting older and my love for the team had a lot to do with how my mindset has changed over the past few years. In the past, it was all about winning! Not winning for the team, but winning for Aaron. I have learned a lot from coach over the past few years. One of the biggest things he has taught me is that is that you need to help others before you help yourself. My main goal and focus this season was to have fun. It's hard to have fun by yourself, but it's easy to have fun with others, no matter the outcome – win or lose! 4. I understand you were a top soccer player for quite a while. Tell me how your passion went from that sport to track. Was it hard to give up soccer and do you miss it at all? I had a few ankle problems while playing soccer. After awhile it got to the point where it was getting bad. After enrolling to Mid-Prairie, my mother and I made the choice to give up soccer. Soccer helped me get to where I am today, hands down. I do miss it at times. Soccer was a huge part of my life, so it will always have a spot in my heart. 5. Is it true that when you first came out for track, you were bound and determined that the 100 and 200 were going to be your events? Tell me about that and how you eventually tried the 400 and 800 and finally embraced those as your main events. Yes, I was strictly a 100 and 200 guy. Coach asked me if I would run a 400 in the medley. I said yes. I was a freshman and didn't know what to think. I will give it a try this once, I said. I popped out a 49.7. That was solid, so we went from there. A few weeks later, Coach asked me if I could run the 800 leg in the medley. I kind of gave him that look that said NO! He then said if you want to run the medley at Drake, you will need to run the 800. I didn't even think; I said sure, why not? A 1:57 split first time out as a freshman. After that, I knew Coach really knows his short sprints and middle distances. Coach also told me everyone wants to run the 100m. Do what others may not want to do, he said. The reason I like the 100m was because if you won, you had the title as being "the fastest man." But Michael Johnson didn't run the 100m and he was given the title the "fastest man" in the world (so my perspective changed). 6. I hear you commute from the Iowa City area every day to come to Mid-Prairie. Tell me what led to that. Did it have to do with your parents’ wanting you in a better school for your sports, or something like that? Are your parents big supporters of your athletic endeavors? Yes, I do travel everyday from Iowa City to Wellman. The trip is about 30 minutes. I was at a point where I needed a change. My mother and I felt we should look at different options. Sports had nothing to do with my switch. My friend’s mother was the principal at the middle school. I told them I would visit. It was different at first; I was out of my comfort zone for some time. But switching to Mid-Prairie was the best choice I have made in my life thus far. 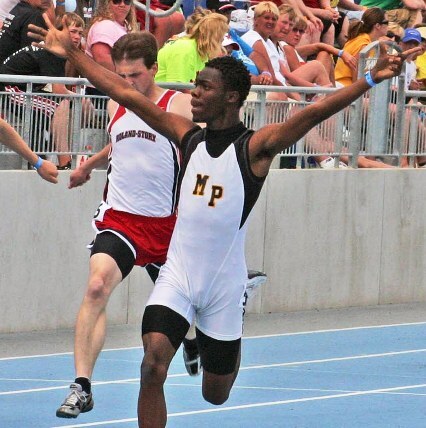 I didn't run track until I got to Mid-Prairie. The only reason I ran was because my friend ran. He was my ride home and I didn't want to wait with nothing to do. My mother is a huge supporter of my athletics. She attends every meet. She also films every meet. My mother loves this stuff (track) just as much as I do. Sometimes I think she may get more excited and love it more than I do. 7. Tell me about the schools you considered and how you wound up deciding on University of Alabama? I had a lot of offers on the table. I was a huge fan of the Iowa State coach. I was most likely gonna go there until they made some coaching changes. He's just like Coach Hollan. They even have the same first name! After that I talked with him and asked where would be the next best place for me to go, and where do you feel safe sending me? He said Alabama! He made a few calls and it went from there. I also took a official visit to University of Georgia. I loved the coaching staff, team, and city. But there was not much choice after I went on my visit to Bama. They made me feel as if I were at home. The thing the really got not only my eyes, but my mother’s, was that the team said a prayer before each meal. They didn't say it as a team; they all seem to do it on their own. Anytime you walk into something like that, it's special. 8. Now that your state meet is done, what are your goals for the rest of the season? What are you hoping to do in the 800 and with the SMR at Nike Outdoor? Now that the season is over I have one goal! The same goal I've had all season; have FUN! This is my last go at the high school stage and I want to make the best of it. I am not worried about times, splits, and what place I get. I just want to have fun and enjoy my last summer training with Coach Hollan. 9. Tell us a little bit about life outside the track. What inspires you the most academically? Do you have plans for what you want to study at Alabama? What do you like to do most when you’re not studying or running? My life outside of track is quite relaxing. I want to be the best I can be on and off the track. When all the running is over, I want to fall back on my education. That's what keeps me going. I don't want to be that guy who could run fast, but can't read, write, or count. I plan to major in Sports Management at the University of Alabama. I want to be the guy who carries himself with his mind, not his feet. I enjoy playing PS3 and watching movies. I also like going out to eat and shopping.